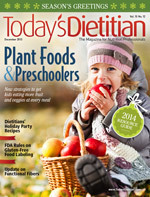 Our October issue contained the controversial article “Coconut Oil” by Aglaée Jacob, MS, RD, CDE. Many readers sent e-mails thanking me for publishing such an article that discusses the purported health benefits and the unique structure of the saturated fats inherent in coconut oil. Readers also thanked me for mentioning that there’s evidence suggesting dietary saturated fat isn’t associated with an increased risk of coronary heart disease, cardiovascular disease (CVD), and stroke, as cited in a meta-analysis of prospective epidemiologic studies published in the March 2010 issue of The American Journal of Clinical Nutrition (and online in January 2010). Conversely, I also received letters from readers who were deeply disappointed in Today’s Dietitian for publishing such an article. Some of you said the article was poorly supported by scientific evidence, inaccurate, didn’t present both sides of the issue, and created the impression that there’s scientific consensus on the dissociation between saturated fats and CVD. While there is credible evidence suggesting that the link between saturated fats and heart disease may not be as strong as many believe, Today’s Dietitian should have done a better job addressing this controversial topic in a more balanced way. There are two sides (at least) to every story, and we need to consistently report them. Nutrition professionals hold different opinions based on the larger body of research regarding the properties of saturated fats in coconut oil and the conflicting evidence concerning saturated fats and their association with heart disease and stroke. There’s legitimate controversy surrounding this topic. As the leading independent voice in the field, Today’s Dietitian won’t shy away from that controversy, but we must balance all sides of it in our reporting. I encourage you to turn to Reader Feedback on page 8 to read the letters I received and the reply from the article’s author. The staff of Today’s Dietitian thanks each of you for reading the magazine as closely as you do and relying on us as a trusted source of information in the nutrition profession.